OK, here's the ham! 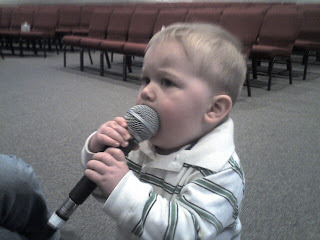 He begged for the microphone all evening at the Southern Gospel Concert. Nothing is cuter than a 12 month old walking around the stage totally blabbing into the mic. I guess I couldn't deny that he's mine even if I wanted...and I don't! What a kid! Oh, and I had him come up on the stage and talk to the crowd before I sang one of my numbers.